I've been meaning to sit down and write for the last few weeks, but this is the first time that I've had both the inclination and the opportunity. Lets see. 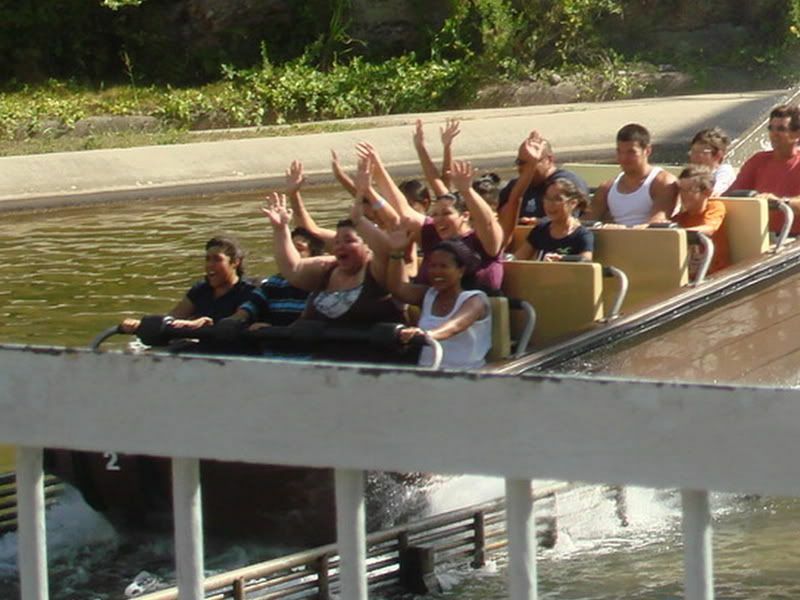 . . two weeks ago on Thursday a group of us from work went to Six Flags Fiesta Texas in San Antonio. The last thing my brother told me before I left was, "Be sure to use lots of sunscreen! "(I have a history of melanoma.) I did, multiple times, yet I was the only one of the entire group to get sunburned. I had to call into work the next night, because it hurt to wear clothes, my bra straps almost killed me! I did get to take a photo with Scooby-Doo. What more could I ask for? If you look closely you can see my wicked burn! The following week I had an appointment with my oncologist, who I was sure was going to yell at me about the sunburn, but she didn't. She was just glad that I got out of the house and had fun. I had the have my Port-A-Cath(or PAC) accessed at least five times without numbing medication (I forgot it at home, an hour from my doctor's office) to get it flushed to prevent a DVT or blood clot. It is supposed to get flushed once a month, when it's not being used. Since I'm not really using it anymore I asked my doctor to make arrangements for my surgeon to remove it. Last Monday in the office, after a lot of lidocaine, my surgeon took out my port. It took about 30-45 minutes. I asked him what he had used to secure it in place since he seemed to have some trouble taking it out. He said that he used dissolvable sutures, but that the PAC grew into my chest wall muscles. So after some scraping he had it out and sutured me up put on a couple of steri-strips and I was on my way home. It's still a little sore, depending on how I move or position myself. It's worse if I decide not to wear a bra, as my top heavy-ness pulls on the stitches some. But on the plus side I am officially now completely off of my immunosuppressive medication. Yay! And by January I will be off of another one. And if that doesn't just frustrate the hell out of me, guess who showed up at our front door today. . . none other than Adult Protective Services! I was going to cry until I found out what we were being accused of. Wait for it. . . we were rude to our Mother! Hold the presses! We don't hit her, starve her, or neglect her. Yes I might be short with her at times, but after taking care of her all day, sleeping an hour or two, driving an hour to the hospital, drive the hour back stopping for groceries, and then having to do it all over again with little or no help, who wouldn't? I was snippy with her and the new attendant on the day that I had my PAC taken out, as I had just had surgery, was in pain, and had to train yet another attendant on how to take care of my mom. I did apologize and explain why I wasn't feeling well. Needless to say she didn't come back. She said she was intimidated by having so much family around. What are we supposed to do, send my seventeen year old brother and his very pregnant girlfriend outside in the 90-100 degree heat so that she can be comfortable enough to take care of my mom? GEEZ! I feel like pulling out my hair! Sorry, I've been needing to get this out all week. On a different note, I found this video today, and thought I'd share. Alan Rickman always makes me feel better. Which Goddess lurks in your soul? It is obvious that leadership is your strong suit! Hera was Queen of all the Greek Gods and the daughter of a Titan. This is no small boast! Hera is selective on who she inhabits and rightfully so. Only those of majestic grace and keen intellects are considered and she will leave in a heartbeat if her host is ungracious or in anyway corrupted by a powerful position. Like Hera, you are a true born leader of the people. Many have come to you over the years seeking guidance and patient understanding to their plights and pains. Your advice is usually rooted in the experiences of your own life and given with great care and caution. Continue on this path and Hera will make you a Queen worthy of remembrance! Rules: Post three things you've done that you believe nobody else on your F-list has done. Indulge in remorse if someone calls you out on a listed item. 2. I've been coded. You know, when they say "Code Blue room ICU B3". That was me. *waves* I don't remember it, thank goodness! A video one of my friends from High School sent me, and my brother sent me, and torenheksje posted. An impressive three things. I would never have the nerve for one. Two is scary and my opportunities for three is probably past! The stuff with your mother sounds awful. I should not be that hard! And I never even heard of adult protective services. You must have the stamina of an ox and the patience of a saint. I was in High school for #1, if I didn't do it then, when else? I didn't know APS existed until a few years ago, either. Stamina, maybe. Patience, not really. I am officially now completely off of my immunosuppressive medication. Yay! And by January I will be off of another one. I say a big YAY for it too!! I'm happy for you that you got rid of it! As for your mother I do understand that you got annoyed. After all what you are compelled to organise and care for this is just ridiculous. I wouldn't have known whether to shout or laugh hysterically if I had been you. You must be a very strong character, girl! What is it about the coding you mentioned on no. 2? I don't have a clue. Is it possible to explain it to me a little more? Edit: "I'm voting Republican" is absolutely hilarious but also tragic!!! LOL Wonder if suchlike could ever run on German TV. I wouldn't have known whether to shout or laugh hysterically if I had been you. ~ I've done both, crying feels better, but getting angry gets things done. What is it about the coding you mentioned on no. 2? ~ In the fall of '06 (Sept./Oct.) I was very ill(I spent my 26th birthday in an induced coma). The doctors still can not determine what caused my problems. I had a pulmonary hemorrhage(my lungs were bleeding) and I couldn't breath. I was in intensive care on all kinds of medications. I had every sort of tube imaginable (and some not so imaginable). I was on a ventilator, fighting for my life. During this time hy heart stopped from the stress my body was under. When something like this happens here in the U.S. we "call a code blue" if the patient doesn't have advanced directives or wishes heroic measures to keep them alive. A team of doctors, nurses, respiratory therapists, radiology, etc. show up to see what can be done to save the patients life. So, that was me, now THIS is me. I may just take you up on your offer to go and get me a Russian guy on of these days. I still have plenty of time. Sorry for responding late, been busy with the doctors and then I didn't feel like writing. Thank you for explaining code blue! *Phheeeewww* What an experience! Since I'm generally curious about medical issues (due to my former profession) I'd like to know if you had a kind of a close-to-death experience while your heart stopped working. I've been reading a lot about it and watching documentations on TV and found it incredible interesting. Don't worry about it. It takes me just as long to respond sometimes, like this time. I hope the doctors are able to help you feel better. Thanks for the compliments on my layout. It took me a while to find something original, that I liked. It had to be something that I wouldn't mind looking at everyday, lol. I don't remember a whole lot of things that happened during my hospitalization. It's kind of weird really. I didn't have a "near death experience" like those documented on TV. I did have some odd dreams, I guess you could call them dream, as I wasn't awake (drug induced dreams?) Maybe those 'dreams' were the near death experience, I can't be sure. I remember trying to communicate by wiggling my toes. I remember hearing my doctors talking about my medications. I remember the special bed that turned me side to side. I know I received my Last Rites, and I know who was there when I was given them, but I don't remember the ceremony itself. I'm too glad you got back to life, girl! An experience one never forgets. I think it also makes you become much more humble and makes you value each moment even more, doesn't it? It does. It also helps me understand what my patients are going through as well. If you look on my profile page there are a couple of layout communities as well as a link to the person who made mine, she has other that are just as nice. If trying to look at everything as something that happens to you because you shall grow from it, this actually has let you grown in view of wisdom, patience, empathyand endurance. I've found a lovely layout at gossymer's and put it up. I think I have grown. Happy that you like my layout! They came back today with four more people in tow. I was being accused of being verbally abusive to my mom, not as her daughter, but as her care provider through the agency. Not fun. Faith is all that keeps me going. Arabic, hmm. . . very interesting. Sorry that it's taken me so long to respond. I've been super busy. The thing was, the day they are taking about I know nothing happened. I think the accusation was a vindictive act from another employee of the agency. What upsets me the most is that the whole incident is going to go into my employment file, even though it was found to be untrue. It'll look bad to any potential employers in the future. Arg! Nothing I can do about it now, except look for someone to replace the undependable attendant, which might take a while. Thank you so much for your prayers. I know that they help. Big hugs for you and yours!